Research reveals that liberals and conservatives in the United States diverge about their beliefs regarding climate change. We show empirically that political affiliation also matters with respect to climate related risks such as flooding from hurricanes. Our study is based on a survey conducted 6 months after Superstorm Sandy in 2012 of over 1,000 residents in flood-prone areas in New York City. Democrats’ perception of their probability of suffering flood damage is significantly higher than Republicans’ and they are also more likely to invest in individual flood protection measures. However, 50% more Democrats than Republicans in our sample expect to receive federal disaster relief after a major flood. These results highlight the importance of taking into account value-based considerations in designing disaster risk management policies. The online version of this article (doi: 10.1007/s10584-016-1735-9) contains supplementary material, which is available to authorized users. Many regions around the globe struggle with limiting the expected increase in natural disaster losses due to climate change and growth in exposure (IPCC 2012). Understanding what drives residents in hazard-prone areas to undertake protective actions is key. It has been shown that liberals and conservatives often diverge in their beliefs about climate change (Dunlap et al. 2001; Feygina et al. 2010; McCright and Dunlap 2011), yet little is known about how political affiliation relates to perception of specific climate risks and adaptation decisions. Here we show that political affiliation, measured as political party identification, is significant in the context of flood risk. Our study is based on a survey of over 1000 residents in flood-prone areas of New York City (NYC). NYC and its surrounding area was directly affected by Hurricane Irene in 2011, and Superstorm Sandy in 2012 (which triggered $50 billion in federal disaster relief). These events made improving flood preparedness a priority for NYC, where action taken at the household level is an important element. Empirical data reveals that many individuals do not voluntarily purchase flood insurance nor do they undertake cost-effective flood-proofing measures (Kunreuther and Pauly 2004; Poussin et al. 2015). To illustrate, 80 % of residents in areas inundated by Superstorm Sandy in the United States in 2012 did not have flood insurance, despite coverage being provided at subsidized rates by the National Flood Insurance Program (NYC 2013). Insufficient flood preparedness has been attributed to several factors, including an underestimation of flood risk and the expectation of receiving post-disaster government relief (Michel-Kerjan and Kunreuther 2011). A review by Kellens et al. (2013) points toward several consistent determinants of flood risk perceptions such as hazard knowledge and past flood experience. Here we focus on political affiliation and how it influences flood risk perception, expectations of receiving federal disaster relief, and adaptation actions. Political ideology reflects shared principles, beliefs and values, a lens through which people view and react to the world around them (Jost et al. 2009). In the United States, political liberals typically affiliate with the Democratic Party and political conservatives typically affiliate with the Republican Party. A much smaller group considers themselves to be Independent. Several studies have found that political ideologies and party affiliations in the United States influence how individuals think about, and act on, environmental-related issues, such as legislation for environmental protection, the environmental movement, investment in energy efficient technology and climate change (Dunlap et al. 2001; Feygina et al. 2010; McCright and Dunlap 2011; Kahan et al. 2012; Gromet et al. 2013). Today, environmental concerns comprise an important component of the political agenda of the Democratic Party, but play a much smaller role in the agenda of the Republican Party.1 For example, political conservatives in the U.S. are more likely to dismiss concerns about climate change to support minimal environmental regulation compared with political liberals (Dunlap et al. 2001; Feygina et al. 2010; McCright and Dunlap 2011; Kahan et al. 2012; Howe and Leiserowitz 2013). The way a person perceives climate change can influence how one interprets extreme weather events. For example, global warming skeptics were found to be less likely than believers to consider an unusually hot summer as abnormal (Howe and Leiserowitz 2013). Other researchers have shown that experiencing a natural disaster, like a flood, can influence demand for energy savings (Spence et al. 2011). We first investigate how political affiliation is related to flood risk perceptions and to expectations of receiving federal assistance in the aftermath of a future disaster. Next, we examine how flood insurance purchase and an individual’s likelihood of investing in risk reduction are related to her/his political affiliation. A random sample of 1035 homeowners residing in property having a ground floor and located in flood-prone areas in NYC answered a telephone survey (73 % response rate). See Online Supplementary Information (OSI 1) for the survey procedure and sample characteristics. Political affiliation was determined by the political party the respondent had voted for during the last Presidential election (November 2012): 40 % voted for the Democratic Party, 26 % voted for the Republican Party, 6 % voted as Independents, and the remainder did not answer. A set of questions (OSI 2) elicit respondents’ perceptions of flood risk and their expectations of receiving federal relief to cover future flood damage. OSI 3 provides questions that were used for our examination of demand for investing in flood damage reduction. We were able to use estimates from a detailed probabilistic flood damage model for NYC (Aerts et al. 2014) which allowed for an assessment (OSI 4) of whether risk perceptions are correct (Botzen et al. 2015). The statistical methods for analyzing the data are described in OSI 5. Several questions elicited a range of indicators of flood risk perceptions (see OSI 2). According to political theories, controversies over risks are viewed as struggles over (political party) interests (Wildavsky and Dake 1990). Such a view could explain why there is less concern about climate change and lower flood risk perceptions among non-Democrats so as to minimize the need for government regulation and other actions designed to prevent or manage these risks. Moreover, according to cultural theories of risk, individuals choose what to fear according to their way of life which is influenced by worldviews or ideologies (Douglas and Wildavsky 1982; Rayner 1992). These include categories of communitarianism and egalitarianism that are related to political liberalism and high perceptions of environmental risk compared to individualism and hierarchism that are related to conservatism and lower perceptions of environmental risk in the United States (Leiserowitz 2006; Wildavsky and Dake 1990; Kahan et al. 2007; Smith and Leiserowitz 2012). Based on the latter, we hypothesise that individuals with a more politically conservative ideology who are more likely to vote as non-Democrats, have lower flood risk perceptions and lower expectations of receiving federal disaster assistance due to a smaller reliance on government. Figure 1 shows the results of differences in flood risk perceptions and expectations of federal disaster relief between Republicans and Democrats, all of which are statistically significant (p-value < 0.05).2 Results for Independents who make up a small proportion of our sample (6 %) are shown in Online Supplementary Table (OST) 1. Significantly, 51 % of those who voted for the Democratic Party think that their flood probability is higher than 1-in-100 compared to only 41 % of people who voted for the Republican Party. A statistically significant larger share of Republicans (31 %) than Democrats (24 %) think that the flood probability equals 1-in-100, while the difference between expec-tations that the flood-probability is lower than 1-in-100 do not significantly differ with respect to political affiliation. With regard to expectations of future flood risks, significantly more Democrats (71 %) expect that flood risk will increase as a result of climate change compared with Republicans (47 %), supporting the findings of a recent study (Bruine de Bruin et al. 2014). 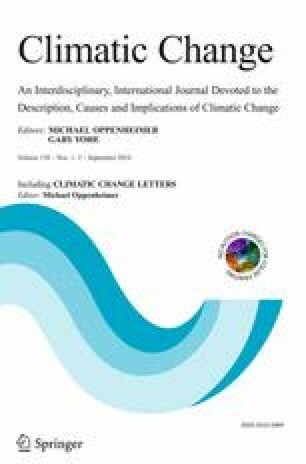 OST 2 provides a more detailed breakdown of these answers for the question related to perceptions of climate change. We also examine how political affiliation relates to the accuracy of flood risk perceptions by comparing the perceived flood probability p and anticipated flood damage L with their objective values (p*, L * ). The results (OST 3) show that only a minority of respondents i have correct expectations of their flood probability p i * and damage L i *. A larger share of Republicans (32 %) than Democrats (23 %) underestimate their flood probability suggesting that they are less concerned about their risk, as hypothesized. Across all political ideologies 50 % underestimate damage. Significantly more Republican voters have correct expectations of potential flood damage (40 %) than Democrat voters (31 %). More Democrat (79 %) than Republican (71 %) voters worry about flooding in part because their perceptions of the flood risk is higher. Difference between these groups in trusting government to address flood risk locally is more pronounced, with 47 % of Democrat voters trusting their local government, compared to only 31 % of Republican voters. This is consistent with the hypothesis that Democrats are more favorably inclined toward regulations than Republicans. Expectations of receiving federal disaster relief also differ significantly between political affiliation, as we hypothesized. In particular, 40 % of Democrats expect to receive relief compared to only 27 % of Republicans. Among those, the expected government compensation as a percentage of damage is higher for Democrats at 23 %, versus 15 % for Republicans. Next we examine how political affiliation affects flood insurance purchases and individuals’ demand for a flood-proofing measure that would reduce damage to a respondent’s property should a flood occur (see OSI 3). Since flood risk in NYC is a low probability event, we are also interested in whether framing this investment under different time horizons would change behavior (Slovic et al. 1978; Weinstein et al. 1996; Kunreuther and Weber 2014), which has not been empirically studied (Kellens et al. 2013). We use a between subjects design in which respondents are randomly assigned to two different frames that describe the average flood damage savings in either a single year (1-in-100 flood probability and savings of $500) or the identical probability and savings over a period of 30 years (1-in-4 flood probability and savings of $15,000) (see OSI 3). We hypothesize that Democrats are more likely to have purchased flood insurance and are more willing to invest in adaptation measures to reduce flood damage than non-Democrats because of their higher flood risk perceptions which is what they focus on rather than their expectation of disaster assistance. We also hypothesize that the demand for adaptation measures will be higher when the flood probability and damage savings are framed over a 30-year period than annually, as shown in other contexts (e.g., Slovic et al. 1978; Weinstein et al. 1996). Many individuals pay little attention to low probabilities; expressing low-probability risks over a longer time period may make these risks more salient to some of them. This may hold especially for Democrats since they have higher perceptions of long-term flood risk as reflected by their higher expectation that climate change will increase future flood risks, as others have also shown (Bruine de Bruin et al. 2014). We find that 66 % of our respondents had flood insurance five months after Superstorm Sandy. A slightly higher proportion of Democrat voters (69 %) had insurance compared with Republicans (64 %). This difference is not statistically significant which may be due to the U.S. mandatory insurance requirement for most homeowners in the 1-in-100 year flood zone. On average, less than half of the individuals (49 %) were willing to invest in the flood-proofing measure. We used linear regressions to assess how this percentage relates to political affiliation (Democrat) as well as the framing of risk and benefits of flood risk adaptation over an annual (Frame = 0) or 30-year period (Frame = 1). The effect of party affiliation is examined using a dummy variable with voting Democrat (= 1) and voting Republican or Independent (= 0).3 The interaction effect of the variables Frame with the variable Democrat captures differences in the framing effect between political affiliations. We also examined whether effects of affiliation are robust by including socio-economic variables similar to those used by other studies that employ regression models to estimate effects of political affiliation (Gromet et al. 2013). As hypothesised, Democrats have a higher likelihood, 13.2 % for the annual frame of investing in the flood-proofing measure than Republicans and Independents (Table 1). This likelihood increases by 13.89 % when framing the flood probability and damage savings over the 30-year period (resulting in a total difference of 27.09 %). This finding is robust to inclusion of several other variables in the analysis (see OSI 6). The negative coefficient associated with framing the probability over a 30-year period, which is a conditional simple effect for non-Democrats, indicates that the 30-year framing has a negative albeit only marginally significant effect (p-value = 0.09) on investing in flood proofing measures for non-Democrats. The simple effect for Democrats of the 30-year frame effect is 4.95 (−8.94 + 13.89) which is not significantly different from zero (F-statistic = 1.23, p-value = 0.27). Nevertheless, the difference in likelihood of investing between Democrats and non-Democrats within the 30-year frame is statistically significant (F-statistic = 16.29, p-value < 0.0001). This overall pattern of results is confirmed by a moderated mediation model presented in OSI 7. In addition, that analysis shows that higher demand for flood-proofing among Democrats is significantly related with their higher climate risk perception. Our study shows that political affiliation significantly influences individual perceptions of flood risk and the demand for adaptation measures today. Flood risk awareness campaigns and policies aimed at incentivizing adoption of adaptation and insurance measures that will be appealing irrespective of political ideology should be considered. Providing economic incentives such as through insurance premium discounts, to individuals who flood-proof their homes beyond the minimum standards should also be appealing irrespective of ideology. Well-enforced regulations may ensure that people invest in cost-effective adaptation measures. The strengthening of building codes in NYC after Superstorm Sandy is a good example of how cities can limit damage from future floods, across political affiliations. While we focus on flood risk in a large U.S. coastal mega-city, our findings are likely to have broader relevance. For example, van der Linden (2015) finds that in the U.K., political party affiliation has a significant influence on climate change perception. Future research could examine whether similar influences of political affiliation are observed in other parts of the world and for different hazards. It has not always been that way. Important environmental legislation was passed by Republican administrations in the 1960s and 70s. Anticipated flood damage as a % of a respondent’s property value and respondent’s thinking that the flood probability is above or below her/his threshold level of concern do not significantly differ with respect to political affiliation. The reason for this classification is that a regression that included dummy variables for Republican and Independent voters showed that there was no significant difference between these two groups, while Democrats and Independent voters did differ (OST 4). We thank Kerr and Downs Research for help with implementing the survey and Carol Heller for editorial support. This research has received financial support from the Zurich Insurance Foundation, the Center for Risk and Economic Analysis of Terrorism Events (CREATE) at the University of Southern California, the Travelers-Wharton Partnership for Risk Management Fund, the Wharton Risk Management and Decision Processes Center and the Netherlands Organisation for Scientific Research (NWO) VIDI (452.14.005) and VICI (016.140.067) grants. We thank NYC-DCP, NYC-Mayor’s Office/OLTPS, NYC-DOB and NYC-OEM.